If you’ve got yourself into a sticky situation with bubble gum, we’ve got the solution. 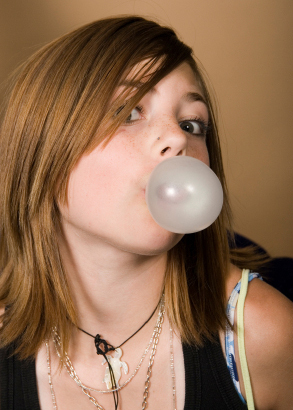 Here are the best ways to remove bubble gum from…well, just about anywhere it can get stuck! To remove bubble gum from skin, put a little baby oil or Skin So Soft from Avon on a cotton ball, then rub the cotton ball on the sticky spot. The bubble gum should peel right off with minimal discomfort. Ouch! If you’ve got kids, you’ve likely found yourself in this sticky situation. The solution may be found in your kitchen cabinet! To remove bubble gum from hair, put a good amount of peanut butter on the bubble gum and work as much of it through as possible, then shampoo the remaining bubble gum out. The oil in the peanut butter counteracts the stickiness of the bubble gum. To remove a bubble gum stain from carpet, you must first remove as much of the bubble gum as possible. This can be done effectively with a blow dryer and a piece of plastic wrap. Heat the gum with your blow dryer, then lift the softened gum away with the plastic wrap. If there is a residual bubble gum stain, blot with a small amount of carpet cleaner and a clean cloth, then dry it immediately. To remove bubble gum from microfiber, spray the gum with a bit of WD-40, then lift the gum up with a clean rag. If you are nervous about using WD-40 on the fabric, separate an egg and soak the bubble gum stain with the egg white for five minutes. Gently lift and peel the gum away as it begins to separate from the microfiber. Have you discovered a bubble gum stain on some clothing in your laundry pile? Removing bubble gum from cloth and clothing requires a cool trick – ice! Simply place one ice cube under the bubble gum stain and another on top, then wait until the ice melts and the gum gets cold and hard. With the non-serrated side of a butter knife, scrape off the frozen gum. Treat the residual bubble gum stain with a clothing spot cleaner or a bit of regular clothing detergent and wash as usual.